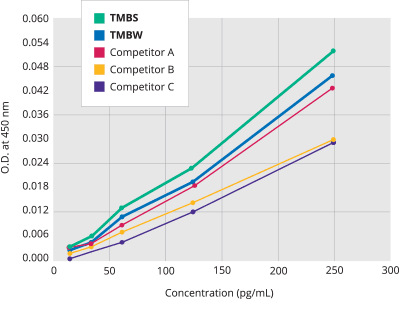 The Surmodics TMB microwell substrate family outperforms competitors for low background, stability and sensitivity with a variety of kinetic rate substrates. 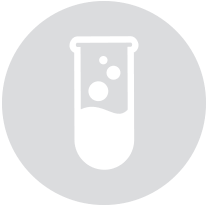 Our one-component formulations provide optimal signal generation and longer shelf lives for ELISA/EIA while streamlining assay manufacturing. BioFX® One Component HRP Microwell Substrate (TMBW) gives assay developers the best possible tool to maximize shelf life stability and lower backgrounds while setting the industry standard for signal generation of the standard curve. Prolonged shelf life. BioFX® One Component HRP Microwell Substrate (TMBW) maintains 96% activity for over 4 years. Thirty-two lots spanning 55 months of production were collected and analyzed in a commercial ELISA assay. 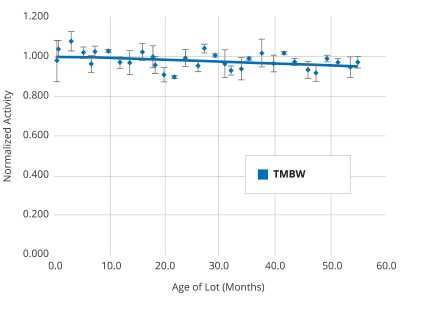 The color development (Abs @650) was monitored for 30 minutes to determine the kinetic rates across 2 different plates (3 repetitions per substrate on each plate) and the results were normalized to a new lot of TMBW (Age of lot=0 months). 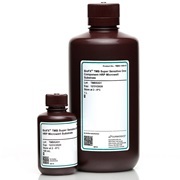 BioFX® Super Sensitive One Component HRP Microwell Substrate (TMBS) gives assay developers maximum signal generation and low backgrounds while maintaining shelf life. Boosting signal strength. 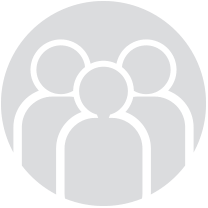 For increased sensitivity, BioFX® TMB substrates generate higher signal per picogram of analyte faster than other TMB substrates. An HRP standard was serially diluted to 256, 128, 64, 32 and 16 pg/mL concentrations. The serial dilutions were added to a rabbit anti-HRP antibody coated microplate, incubated and washed. Each manufacturer’s TMB was run in triplicate for each serial dilution, incubated for 10 minutes and stopped. Absorbance was read at 450 nm. Unparalleled consistency & quality. BioFX® TMB substrates are manufactured under conditions that provide less than 5% variation among production lots. Surmodics is ISO 13485/9001 certified and is committed to delivering quality products. An HRP standard was added to a rabbit anti-HRP antibody coated microplate, incubated and washed. 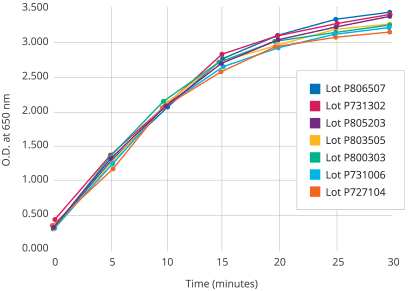 7 different lots of TMBW were added to designated microwells and absorbance was read every 5 minutes of the kinetic assay.